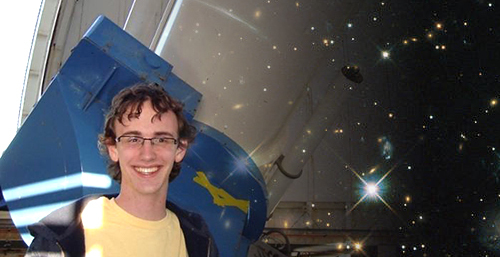 As a Union College Astrophysics minor, you will learn how to apply the principles of physics to astronomical phenomena, leading to an understanding of the structure and history of the universe. Students pursuing a minor in astrophysics take an introductory course, The Solar System, and five classes selected from Introduction to Astrophysics; Stellar Structure and Evolution; Galaxies; Cosmology and General Relativity; Observational Astronomy; and Radio Astronomy. In the laboratory-based Observational Astronomy and Radio Astronomy courses, students use the College's 20-inch optical telescope, equipped with CCD cameras and spectrograph, the 7.5-foot radio telescope and the table-top radio interferometer. Four of our physics and astronomy faculty members pursue astrophysics research, with specialties in star formation, nucleosynthesis in supernovae, galaxy evolution and active galactic nuclei. Students are encouraged to participate in research, including cutting-edge projects supported by Department of Energy and National Science Foundation (NSF) research grants. Students can make a series of observations with the Union College telescope to track transits of extrasolar planets. They can manipulate computer simulations of the creation of the chemical elements in the explosive deaths of the most massive stars. Many students participate in the NSF-sponsored Undergraduate ALFALFA Team, a consortium of 19 institutions led by Union, collaborating with Cornell University on the international ALFALFA (Arecibo Legacy Fast ALFA, where ALFA refers to the Arecibo L-band Feed Array detector) survey. In addition, our affiliation with the NASA NY Space Grant offers opportunities for internships at Union and NASA centers to carry out NASA-related research projects.